I hope you all are enjoying your day and if you're going trick or treating or taking your children trick or treating make sure you have loads of fun and stay safe. I have decided to postpone my October Favourites and do that post next week and today I am going to share with you my pumpkin seed love and my favourite simple recipe for baking them but before I do that I have to get to the GIVEAWAY winner. If you remember from 2 weeks ago I was hosting a GIVEAWAY of Bioderma Cleansing Water and Nars Purifying Foam Cleanser and yesterday at 11:59pm the GIVEAWAY ended and I have announced the winner on Twitter but I will officially announce it here as well. The winner is..... Let's have a DRUMROLL....................... CHRISTINA DRAGAN! I have contacted Christina by email. If winners of my GIVEAWAYS do not contact me within 3 days I will have to choose another winner. Thank you all for entering my October GIVEAWAYS this month. I am done with GIVEAWAYS for now but I can guarantee that I will have at least 1 GIVEAWAY in December so stay tuned for that. 1) Cover a baking sheet with foil. 2) Take a spoonful of butter and melt in the microwave for around 30 seconds. 3) Take butter and pour it onto aluminum foil covered baking sheet and spread nicely. 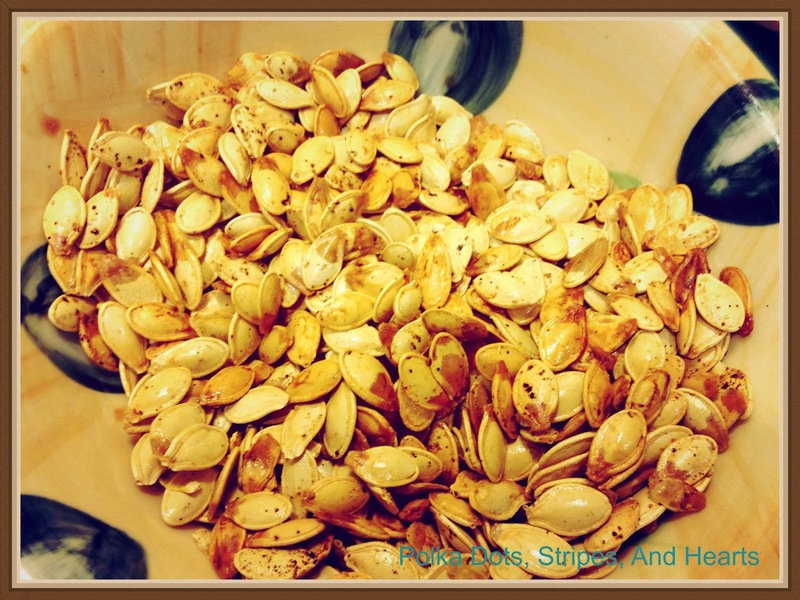 4) Scatter pumpkin seeds over the butter on the baking sheet. 5) Use salt and pepper to season the seeds. 6) Bake seeds at 400 degrees celsius for 20 minutes. This is such a simple recipe and when they come out, they taste almost like popcorn. I love this variation, it is so easy and so delicious. Let me know in the comments below what your favourite pumpkin seed recipe is and tell me what you are going to be for Halloween or what your kids are dressing up as or tell me your favourite costume throughout the years. Mine was in kindergarten when I dressed up as Snow White.